Annoying and self-righteous at times, lovable and insightful at others, Mike Borden, the protagonist of Darkling I Listen, is a character that I will not soon forget. Like all of the characters in this intensely human novel, Mike is believable precisely because Fiore treats him, his life, and his experiences, with so much respect. Typically modern themes such as self-discovery and the search for authenticity are stripped of their glamour in Fiore’s hands, for he refuses to see character development and change over time through the rose-colored glasses of nostalgia or the cheapening lens of moral progress. Instead, every love affair (no matter how brief), every event, every moment, indeed every state of mind, is treated like a free-standing end in itself, which does not need to be justified by the future, much less the past. Fiore’s characters do not pass through “stages” on the road to some sort of higher perfection; truth with a capital “T” is not exalted here, and there are no dramatic conversions on the Road to Damascus. Instead, illusions that have grown tired and old are quietly shed like autumn leaves. Change is neither to be feared nor reified in Fiore’s world; it is to be seen merely for what it is, inevitable and ultimately tragic: tragic, because a beautiful moment that has passed is gone, and a love lost is a love lost forever, not some sort of educational exercise. Fiore’s flexible prose reflects this sensibility, changing as the characters change throughout the novel. 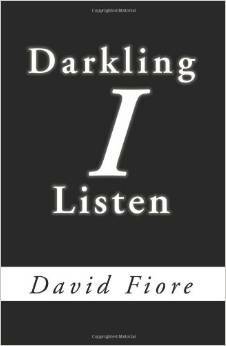 Indeed, there is no authoritative narrative voice or overarching mood to be found in Darkling I Listen. That is not to say that judgments are not made, for this novel is filled with them. When flaws or contradictions are described, however, they are described with compassion, love, and the sensible humility that comes with a good memory.